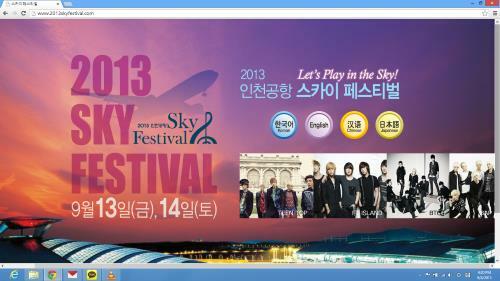 This year’s Sky Festival, hosted and organized by Incheon Airport, is going to be held on September 13 and 14th. There will be two free concerts for the general audience: a classical concert on September 13th and a KPOP concert the next day. Reservation for the tickets were opened last Monday, September 2nd. US-bound passengers may also watch the concerts without making reservations. Who will be performing at the KPOP concert? Sistar, Exo-K, BAP, BEAST, FT Island, Teen Top, BTOB and Girl’s Day. Aside from the concerts, there will also be special activities like World Folk Costume, World Folk Play Experience, Flea Market, Play Zone (for kids) and so much more. Check the website and you’ll find out that the Philippines is part of this event. “Tinikling” will be featured as one of the “folk plays” and the “rain stick” in the Musical Instruments section. If you happen to be in Korea for the said events, you could ask for the free tickets from the board or free Kpop tickets in English. wow daming groups. tyak masaya yan..